NCH Software recently outed a new release of the worlds most popular free transcription software for Windows, Express Scribe, which is finally compatible with DSS Pro audio file formats, better known as .ds2 files. Not only that but NCH claims that Express Scribe is compatible with both Phillips DSS Pro and Olympus DSS Pro audio files (yes there is a difference even though DSS Pro is supposed to be a standard). As yet .ds2 can only be played by Express Scribe on Windows. The Mac version (as of version 5.32) remains without .ds2 support. Starting with v5.40 there’s a paid version called “Express Scribe Pro”, which is required to load DSS Pro files. That’s interesting and way overdue. 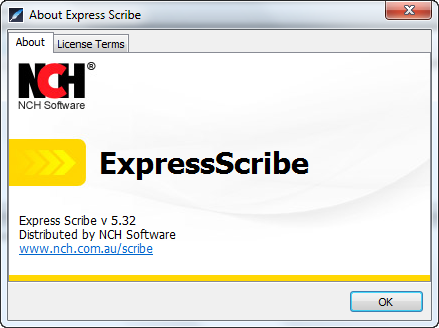 As your anonymous commenter pointed out NCH did split out a New Professional Version of Express Scribe. I’m glad that there is at least one user who will be happy to pay us for it. We know there a lot of transcriptionists out there who are fans of Express Scribe and we are hoping there won’t be too many people upset by the transition but we also hope that it will help us better maintain and improve the product. We have been supporters of Scribe for years now and even went as far as getting a logo branded version a couple of years ago. I often direct people to Scribe who come to me for advice on recorders and transcription, even though we sell the Olympus transcription kits, there are many circumstances where Scribe is a more viable option for them. For US$40 for the Pro Version of Express Scribe this is still a bargain. For those who have used Scribe for years and even those new to Scribe this is a small price to pay for some excellent transcription software. I wasn’t aware there was a Pro version, thanks I’ll check it out. I actually prefer to use ES over my paid-for transcription software as I like the way I can see all the files that are waiting to be done – although I have found sometimes it won’t read DSS files. I’ve one client in particular who emails me through a batch and every now and then it refuses to even acknowledge it’s there, in the list of files…. very odd! So do I have to purchase the Pro version in order to play my DSS files from Phillips? I have downloaded the new free version, and still cannot play the DSS files. Yes the paid version from v5.40 onwards will play .ds2 audio files as well as some video file formats. You can use the software free for a couple of weeks to try it out, while in its free period you will be able to transcribe .ds2 files. After that yes you will need to pay for the Pro version or add/remove programs and un-install to get the option to roll back to the free edition of Express Scribe.